Step 1 Heat the oven to 350 degrees. Toast the hazelnuts in a shallow baking pan in the oven until the skins begin to split, about 7 minutes. Transfer to a strainer. Step 2 Rub the hot hazelnuts energetically with a towel against a strainer to remove some of the skins. Cool the nuts completely. Reserve 2 tablespoons nuts for garnish. Step 3Grease a 9-inch springform pan. If you would like to turn the cake out instead of leaving it on the springform pan's base, line the base with a round of foil and grease the foil. Step 4Grind the hazelnuts with the almonds, cake meal and one-fourth cup sugar in a food processor, stopping to scrape down a few times, until very fine. Step 5In the bowl of a stand mixer using the paddle attachment, or in a large bowl using a hand mixer, beat the egg yolks with one-half cup sugar until the mixture is pale and thick, about 3 minutes. Stir in the orange zest. Step 6In a clean bowl, whip the egg whites with a pinch of salt to soft peaks, starting at low speed and continuing at medium speed. Gradually beat in the remaining one-fourth cup sugar at high speed and continue beating until the whites hold stiff, shiny peaks. Step 7Gently fold the whipped whites and the nut mixture into the beaten yolks, alternately folding in one-fourth of each at a time. Transfer the batter to the pan. Smooth lightly. Bake until a cake tester inserted in the center of the cake comes out dry, about 30 minutes. Step 8Cool the cake for 5 minutes on a rack. Run a metal spatula gently around the cake and remove the sides of the springform pan. If you like, invert the pan onto another rack and gently remove the springform pan's base. Leave to cool completely. The cake will sink slightly in the center as it cools. Step 9Chop the reserved hazelnuts to use for garnish. Step 1 0To make the glaze: Combine the chocolate, 1 tablespoon oil and 1 tablespoon Sephardi syrup in a medium bowl set over a pan of simmering water over low heat until the chocolate melts. Remove the bowl from above the water, and gently stir the mixture until it is smooth. Stir in 2 teaspoons Sephardi syrup and the remaining 2 teaspoons oil. Step 1 1Let the glaze cool slightly; it should still be pourable. Spoon the glaze slowly over the cake. Lightly spread it to a thin layer over the top of the cake; if you like, allow the glaze to drip down the sides of the cake at a few points. Sprinkle the top with chopped toasted hazelnuts. Step 1 2Let the cake stand until the glaze sets, about 15 minutes; if the weather is warm, refrigerate the cake until glaze sets, about 10 minutes. Step 1 3Halve the strawberries and slice them thin. Shortly before serving, stir the strawberries into the remaining Sephardi syrup. Step 1 4Serve the cake at room temperature, on plates with raised rims, with the chilled strawberries in syrup in a separate bowl. In Recipes-list.com we have selected the most viewed recipes from category - Desserts . Enjoy the best recipes specially selected for you! 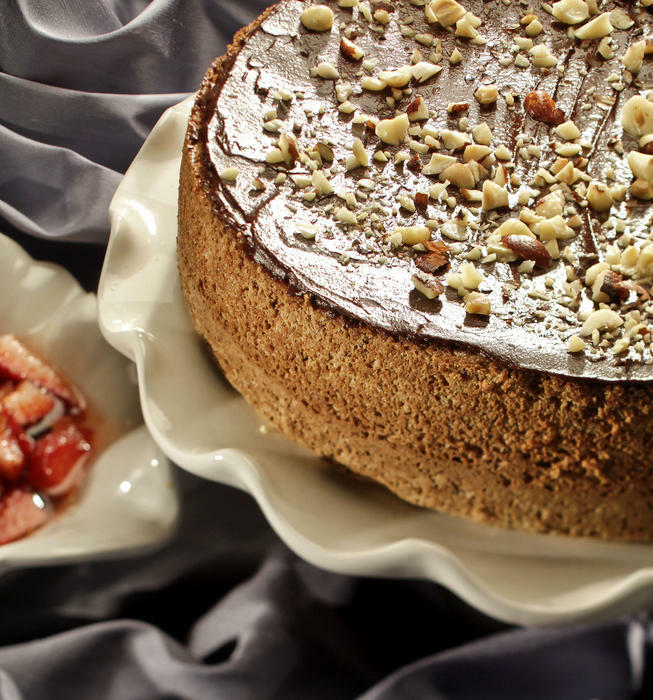 Chocolate-glazed nut torte with strawberries in Sephardi syrup is the right choice that will satisfy all your claims.